This is a seriously impressive video slot. When you see the intro, you feel like you’re about to watch a movie that you REALLY want to watch. Suspense, intrigue, lots of question marks. 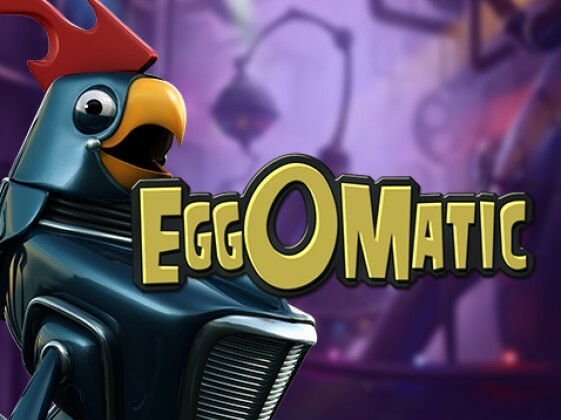 EggOmatic is a slot by NetEnt and a true pleasure to play. Before you play, you see a little intro video about the game’s story. The chickens aren’t producing enough eggs at the factory so the boss rooster is asked for a solution, which comes in the form of the EggOMatic machine. Robot chickens producing eggs…great solution! 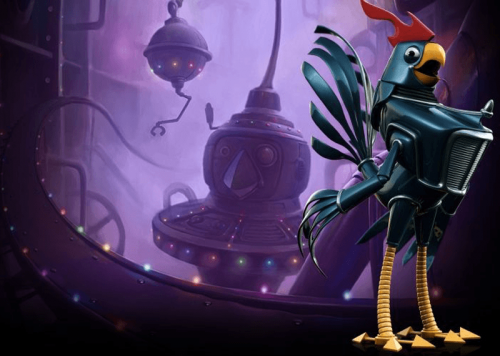 On the reels you’ll find different coloured robot chickens, the wild rooster and several ‘surprise’ eggs. But more about those symbols below. There are different robotic chickens on the reels, each one has a different value. The bigger symbols are worth more than the small chickens. Each figure is impressively detailed and you can often tell from their look how much they’re worth. What makes this slot extra exciting is the background music you hear coordinating with the symbols and what is happening on the reels. The Wild symbol is a rooster and there are the robotic chickens which each have their own quality eggs. For example Free Spins egg, Coin egg and Surprise egg. 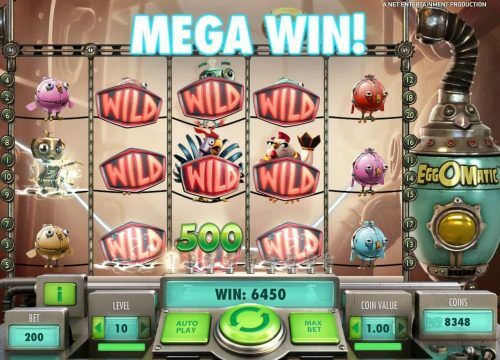 This slot masterpiece is made by NetEnt. The theme, symbols and graphics are all exceptionally well thought out, which makes their slots popular among many players. NetEnt slots are very well executed, it’s easy to understand also for new players because their slots have such a clear overview. NetEnt has really outdone itself with the animations on the EggOmatic slot, they’re so realistic and well done it could be a movie.